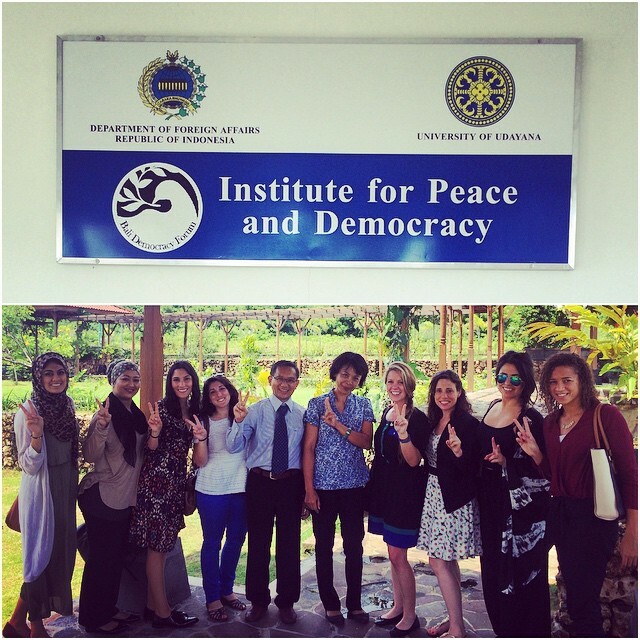 The USC MPD Research Group meets with the Institute for Peace and Democracy at Udayana University in Bali, Indonesia. Our very last meeting of the trip scheduled in Bali, the Institute for Peace and Democracy (IDP) at Udayana University, was one of our absolute favorites; it was fascinating to hear their story of growth from a small closet-space of an office to what it is today—an institute that intersects academia, government, and the private sector to promote global democracy. IDP Director Dr. Ketut Erawan and Ayu Wijaya, a staff member of the Institute, conversed with us about what democracy means to them—which was building trust, minimizing inequalities, and protection from capture. The organization’s goals are threefold: to create a space for media, policy, and research to share ideas, acting as a thinktank, and supporting the system of democratic processes. The last goal was the most relevant to the field of public diplomacy, and to us as aspiring PD practitioners. Our hosts explained the use of Hard Power, Soft Power, and Smart Power was essential to the functioning of IDP. They also emphasized other factors of PD with which we were very familiar, listening and relationship building. They joked about using “dog diplomacy” with colleagues from Laos in helping them to build informal relationships abroad. Additionally, as Public Diplomacy students, we were pleased to see a system of evaluation that the Institute used to reflect and improve on certain academic, cultural, and exchange programs. Amongst IDP’s many leadership initiatives, the annual Bali Democracy Forum stands out as the most prominent. Held every December in Bali, Indonesia, this forum promotes cooperation between democracies within Asia, and “aims to strengthen the capacity of democracy and democratic institutions through inter-state discussions.” There are 20 participating countries, each represented by its Secretary of State. We are curious to know how such programs, especially region-specific programs such as the Forum, can and has affected relationships between nations. Has the program been fruitful? Are there any areas of improvement? Can it be implemented in a similar fashion for other regions? For us, the Institute for Peace and Democracy provided a prime example of intersecting fields of Public Diplomacy. It was an example of policymakers, civil societies, and academics collaborating for common interests- in this case, the pursuit of democracy.